We were instructed on Thursday of last week by a company that was being prevented from paying its staff. By Friday afternoon, and a couple of court hearings later, it could pay them but the way we got there appears to be unusual, in Scotland at least. The clients had had a petition to wind them up presented by HMRC. The petition was based on estimates of liability which the clients disputed. None of that is uncommon but what was a bit unusual was that the clients had plenty of money held at credit with their bank. The problem was that the bank had seen advertisement of the petition and had frozen the accounts. The effect was that the clients couldn’t trade, even profitably. They were unable to pay their staff. They were unable to pay their suppliers. They were even unable to pay their accountant to produce the financial information we needed to vouch their defence to the petition. They were, then, being prevented from defending a petition to wind them up because a petition to wind them up had been presented. Most bizarrely, the bank was preventing money coming into the accounts by refusing to collect on cheques or direct debits from customers who were trying to make payment. Any liquidator subsequently appointed might have something to say about that. (1) In a winding up by the court, any disposition of the company’s property, and any transfer of shares, or alteration in the status of the company’s members, made after the commencement of the winding up is, unless the court otherwise orders, void. The effective date of winding up will be backdated to the date of presentation of the petition and any “disposition of the company’s property” made after that date would be void. So, didn’t the bank have every right to freeze the account to stop what might end up being "void" payments from the account, even if to staff? 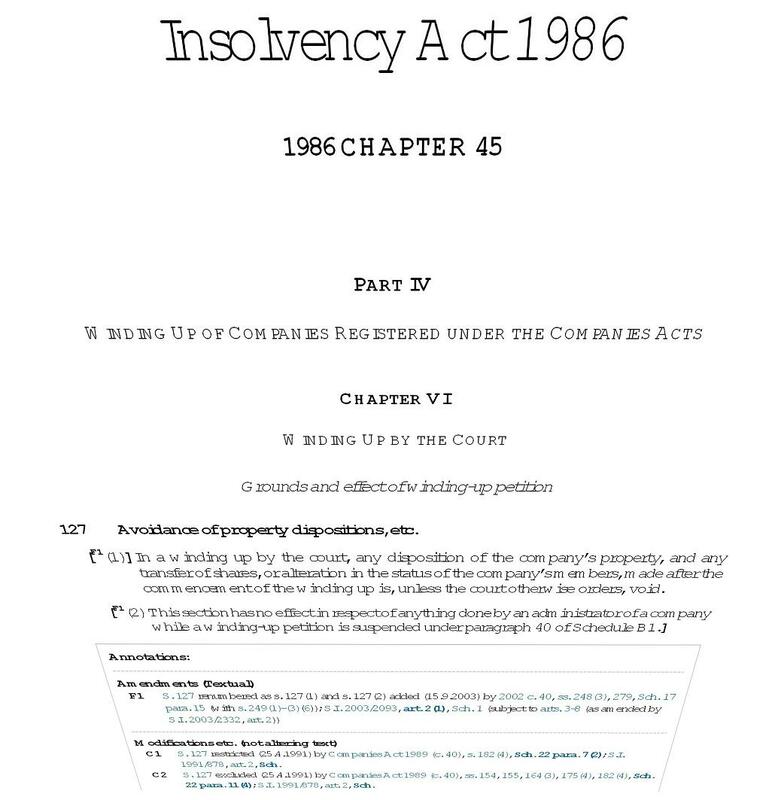 Even where a company is operating in overdraft, “the use and indeed partial or total exhaustion of [an]… overdraft limit by the company cannot constitute a disposition within Section 127…for there is no disposition of the company's property: the disposition is of the bank's property”. 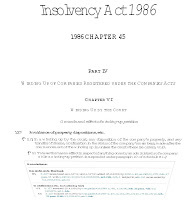 Where the account is in credit, “payment by the bank as agent for the company of the company's money does constitute a disposition to the payee by the company within Section 127 and is recoverable by the liquidator from the payee”, not the bank. For a bank, then, to fail to honour cheques properly drawn on an account may constitute “a breach of contract with the most serious possible repercussions for the bank and the company”. Quite. So, the bank simply had no proper interest in preventing the normal operation of the accounts. Even more persuasive, we thought, was the fact that the courts have made it clear that the purpose of s127 is to prevent disposition of the company’s property to the prejudice of the general body of creditors. Wages are a preferred debt. Payment of a preferred debt cannot prejudice the ordinary creditors because it’s a first call on the insolvent estate anyway. The bank would not, however, relent. We were forced then to make an application for an order under s127 (the key provision being "unless the court otherwise orders") to allow payment of wages and legal expenses. The “validation order” (though the section doesn’t use the term) is something very well known to the courts in England. There is a body of reported cases and practice direction and applications are frequently and routinely made. In Scotland, they appear to be much less common. Neither the Sheriff nor his clerks had seen one before. Anyone who can say if that is their experience too, or who can offer an explanation for the differences between the two jurisdictions, is welcome to post a reply. Perhaps the reason is simply that the period between presentation of a petition and the granting of a winding up order is so much shorter than it is in England and so there is less to be gained by applying for prospective validation of anything. In any event, we made application by Note in the liquidation process, with the appropriate averments and supporting material, and the Sheriff was duly persuaded to grant the order we asked for. That was all very gratifying but it still leaves questions, surely, as to what rights banks have to freeze accounts in this way. It is of the very essence of the relationship between a bank and its customer that the bank will act to receive money and collect on cheques paid into the account, and honour instructions by properly drawn cheques or otherwise for payments from it. One commentary on the Hollicourt case noted that it was likely to have the consequence that “astute banks will cease freezing company accounts on notice of winding-up proceedings” but acknowledged that “less astute banks will continue to do so, and in doing risk breaching their duties to their client and consequential claims from the company or its liquidator”. Over ten years on from the Hollicourt and Coutts decisions, it’s disappointing, to put it no higher, to see that there are still some whose actions put them into the “less astute” category. Halliday Campbell WS are Signet Accredited Specialist Commercial Litigation solicitors. We have been listed by Legal 500 as a leading commercial litigation firm every year since 2013. We were Law Awards of Scotland Litigation Team of the Year 2015, commended in 2018 and finalists in 2012, 2013 and 2014. We were Scottish Legal Awards Litigation Firm of the Year finalists in 2011 and 2012. We are located in Edinburgh, Scotland. Find out more about us, our services and what we can offer, our awards and expertise and our full contact details.